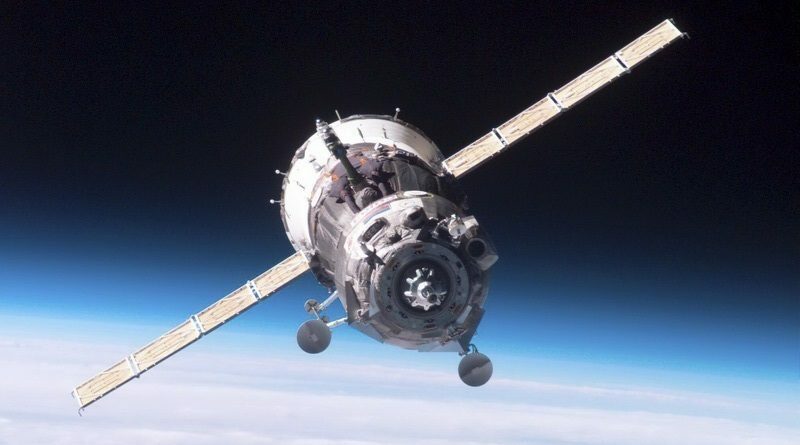 The Soyuz MS-02 spacecraft with three ISS Expedition crew members on board is inbound for an automated rendezvous on Friday after successfully raising its orbit on Wednesday and Thursday, sticking to a two-day flight profile to test out the newly introduced MS systems upgrades on the trusted Soyuz crew ferry. 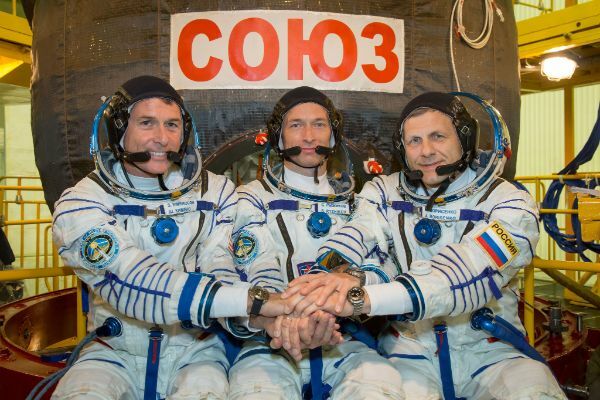 Soyuz Commander Sergei Ryzhikov and Flight Engineers Andrei Borisenko & Shane Kimbrough made an on-time liftoff from the Baikonur Cosmodrome atop a Soyuz FG rocket on Wednesday to begin a nine-minute climb into orbit. 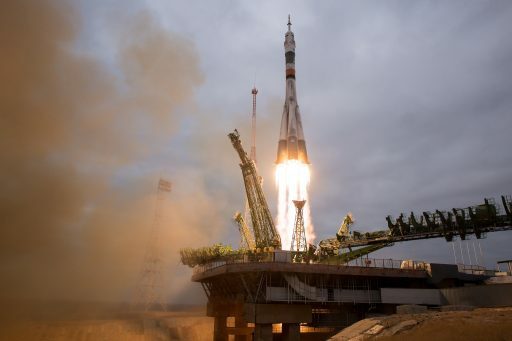 Rising from its pad at 8:05 UTC with a thrust of 422-metric-ton-force, the 49.5-meter tall Soyuz FG rocket pitched over onto a north-easterly heading to begin its high-speed chase of the International Space Station. Soyuz dropped its four boosters two minutes into the flight and the crew got their first look outside half a minute later when the launch shroud split open and fell away from the rocket that continued powering towards orbit with its 102-metric-ton force Core Stage. Cutting off the four-chamber main engine, Soyuz handed propulsive flight over to the Block I third stage that began its operation with a hot staging maneuver and fired four nearly for minutes to deliver Soyuz into orbit. 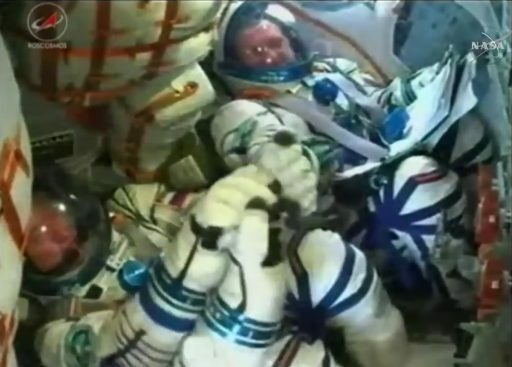 Onboard video showed the familiar jolt when the upper stage shut down and the force of raw rocket power subsided to the sensation of zero-gravity for the three crew members. Soyuz MS-02 separated from the carrier rocket eight minutes and 48 seconds after liftoff and Mission Control Moscow almost immediately confirmed the successful deployment of the spacecraft’s two power-generating solar arrays and communication antennas. 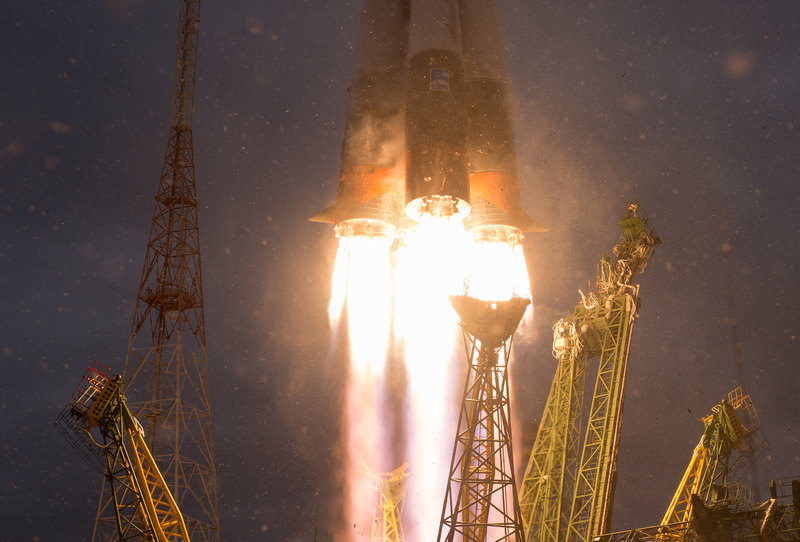 Soyuz FG performed flawlessly to check off its 57th successful launch, delivering the Soyuz to a perfect insertion orbit of 200 by 242 Kilometers according to the Russian Mission Control Center TsUP. Drifting out of ground station range, the crew was given a Go to open their helmets and work through their checklists as written, starting with detailed in-orbit checkouts and a pair of orbital maneuvers before ingressing the Soyuz Orbital Module for the two-day flight to the Space Station. 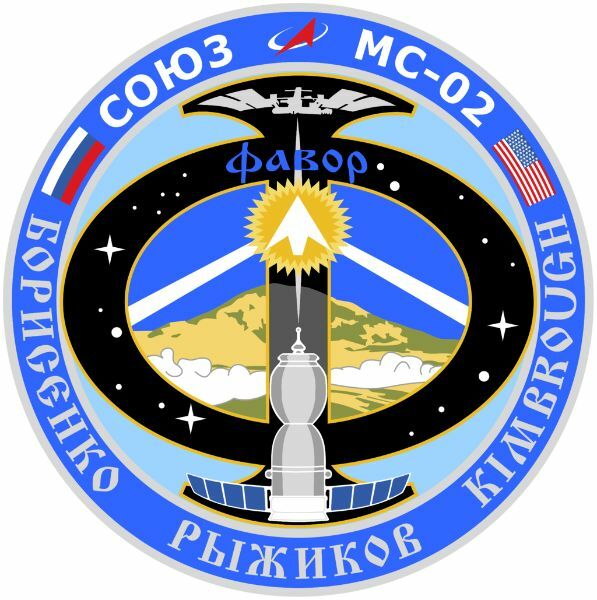 Soyuz MS-02 is the 131st flight of the Russian Soyuz craft, but only the second of the new MS series with modified systems to keep up with the current state of technology. It was preceded by three successful Progress MS missions that host some of the updates as well as Soyuz MS-01 which completed a successful two-day rendezvous in July. However, engineers desired more testing data collected in the flight environment, requiring Soyuz MS-02 to fly the longer two-day approach. Particular focus on this mission lay on checkouts of the fail-safe and backup systems of the Soyuz spacecraft to ensure crews could fly the spacecraft manually in case of a failure of its onboard computer. 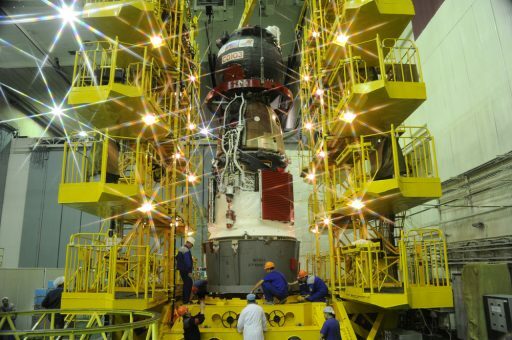 Two tests performed on Wednesday called for the crew taking manual attitude control and also testing whether manual commanding of the SKD main engine was possible to ensure Soyuz would still be maneuverable if its Digital Flight Control System became unavailable for some reason. The MS upgrade is primarily focused on the spacecraft’s Navigation, Control and Communications systems, highlighted by the introduction of a new Unified Telemetry and Command System. Soyuz MS has the capability of communications with the ground through the Luch data relay satellites in Geostationary Orbit, allowing crews to stay in touch with mission control for the majority of their treks around Earth instead of only having brief periods of contact on half of their daily orbits. Soyuz MS features satellite navigation for orbit determination, an improved KURS rendezvous system, a new proximity communications link for relative navigation with ISS, more powerful solar arrays, a new, fault-tolerant thruster arrangement and an additional drive mechanism in its docking system – all to make the spacecraft more robust and adding new capabilities. Soyuz MS-02 was set for a pair of SKD main engine burns on its third orbit around the Earth, firing the 300-Kilogram force S5.80 engine for 62 and 64 seconds to raise the vehicle’s orbit en-route to a Friday morning rendezvous with the space station. Orbital tracking showed Soyuz successfully completed the Flight Day 1 maneuvers and lifted itself into an orbit of 289 by 307 Kilometers, 51.64 degrees. 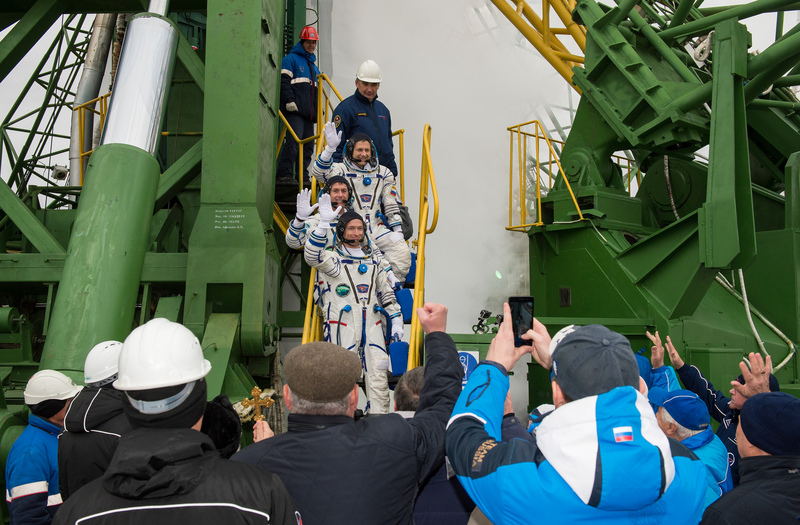 The Soyuz trio placed their spacecraft into an attitude optimized for power generation and thermal control and turned in for their first night in space on their sixth lap around the planet. Thursday was dedicated to a small orbital clean-up maneuver to properly position the Soyuz for the initiation of the Automated Rendezvous Sequence Friday morning. Also, more testing of the motion control system and the new Unified Command and Control System were to be completed to put the new systems through their paces. The Automated Rendezvous Sequence will be initiated at 7:34 UTC when Soyuz will still be in an orbit 100 Kilometers below the Space Station. A Rendezvous Impulse performed at 7:56 UTC will act as the Approach Initiation Maneuver with another to follow at 8:18 UTC to circularize the orbit near that of the Space Station. By that time, Soyuz will be within 200 Kilometers to ISS; allowing a proximity communications link to be established for the exchange of relative navigation data and to relay voice communications to Mission Control. The two Luch-5 communications satellites will also provide data and voice relay functions. The KURS system on ISS and its improved KURS-NA counterpart on the Soyuz power up at 8:22 UTC with Soyuz first employing omni-directional antennas to determine the direction of the Station’s signal to be able to point the NA antenna toward ISS for range and angular measurements. Under KURS guidance, Soyuz performs another rendezvous impulse to begin aiming for the Ballistic Targeting Point. 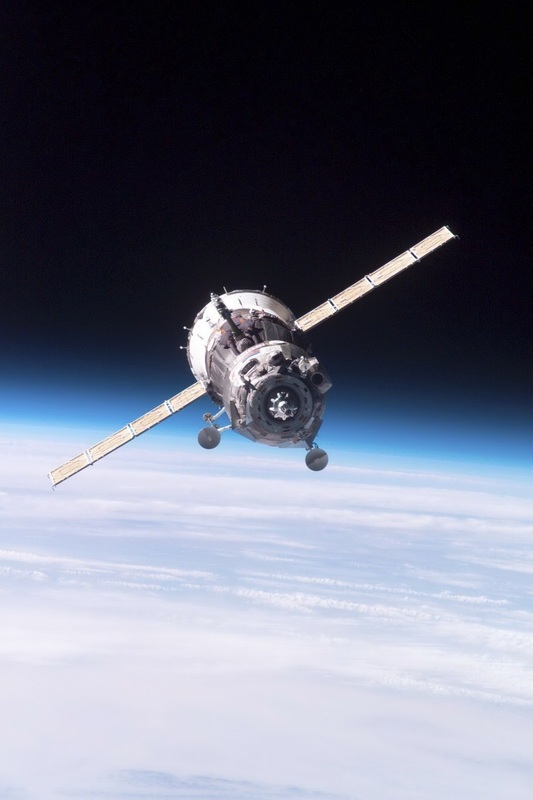 The validity of KURS navigation data will be checked twice, when Soyuz is at 80 Kilometers and closer in at 15 Kilometers to make sure the system is feeding good navigation data to the flight computers. Once the TV System of Soyuz is activated, the three crew members will be getting a look at their destination with the Station growing noticeably as the spacecraft approaches. The crew will be closely monitoring the automatic rendezvous sequence, ready to take manual control in the event of a problem with the spacecraft. Soyuz will initially aim for a point one Kilometer from ISS and correct the intentional target offset by making three propulsive maneuvers starting at 9:25 UTC. During this time, the spacecraft will be in constant motion, maneuvering between burn attitude and Line-Of-Sight attitude using its DPO attitude control thrusters which will also be in charge of the final braking maneuvers when Soyuz gets close to ISS. Reaching a distance of 400 meters to ISS, Soyuz will initiate its flyaround sequence to slowly move around the Station to get aligned with the Poisk module. After the nine-minute sequence, Soyuz will come to a stop 200 meters from the docking port, entering a short period of Stationkeeping so that the crew and the ground can check the alignment. Once Mission Control provides a go for final approach, Ryzhikov will issue the command for Soyuz to pulse its DPO thrusters and initiate a slow closing rate. The straight-in approach is expected to take ten and a half minutes and Soyuz will prepare for contact by powering up its docking mechanism. Docking is expected at 9:59 UTC, though the exact timing can vary by a few minutes due to the flexible duration of the stationkeeping period. After motion between Soyuz and ISS dampens out, the spacecraft will retract its docking probe and hooks on both sides of the interface will close to form a hard mate between ISS and Soyuz – booked for a stay of 128 days. 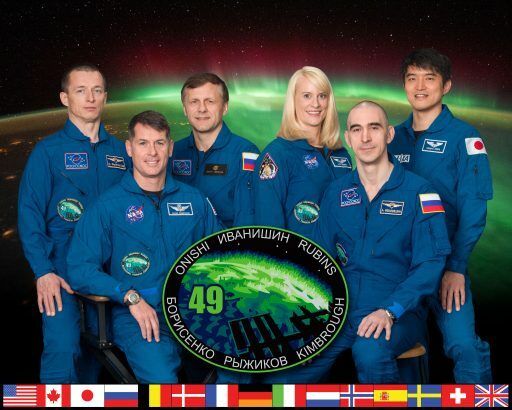 Leak checks will get underway a short time later to verify the interface is air tight before hatches are opened and the new crew members can be welcomed by the resident crew of Expedition 49 commander Anatoli Ivanishin and Flight Engineers Takuya Onishi and Kate Rubins. 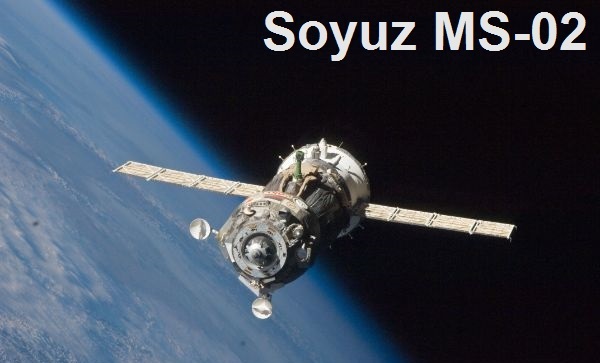 Copyright © 2019 Soyuz MS-02 | Spaceflight101. All rights reserved.